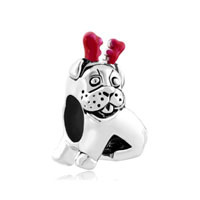 - Dog - Pug Charm is approximately 1/2" X 1/2"
Silver 3D Fawn Pug Silver Charm with multi-color Enamel is available from jewelbasket.com for only $110.02. Buy now and save. Jewelbasket offers the best value on , jewelry and gifts. The sculpted image of this miniature pug, captured in antiqued sterling silver, will win its way into your heart. It measures approximately 12 x 11mm with a 4mm core that is interchangeable as well as compatible with Reflections, Expression, Kera, SilveRadoand other popular 3mm bracelets and necklaces.